The current Mac OS at the time of this post is Version 10.8: "Mountain Lion." If you can't find an answer to your questions here please contact us at macsupport@dvo.com When writing please include your os version and type of computer along with a detailed description of the problem. Why won't Cook'n install on my Mac? How can I print if I get the error "Could not open the editor: Could not read input File?" Why do I sometimes get a "chapter.pdf" or "recipe.pdf" error when I try to print? Cook'n 10 for Mac keeps telling me there is an update, but it never updates. Why? I get a "Data import failed" error when I try to import a new cookbook. Why? If you are unable to install or get the message "Installation failed," please make sure your Privacy & Security settings are set to allow installations from anywhere. Also make sure you are logged into your Mac with admin privileges. If the program still will not install, please email macsupport@dvo.com and request a new link to download the program again. Click on the apple icon on the top left of your screen and from the dropdown menu select "system preferences" option. Under the System section near the bottom there is an option called "Accounts" the icon is two people. Select it. 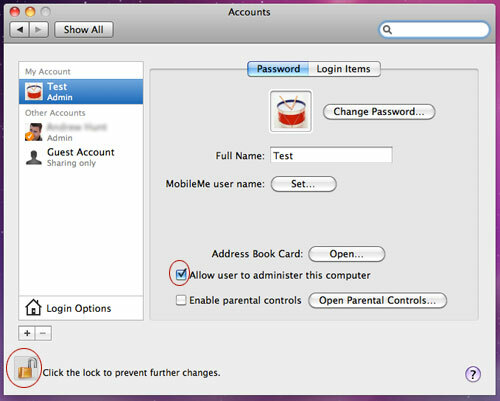 In the Accounts window simply check the box that says "Allow user to administer this computer" (see picture for example). If the option is grayed out, select the locked icon at the bottom left of the window (see picture example) Enter in the admin username and password to unlock, then check the box. This error requires a re-install of the program using a newly downloaded install file. Please email support@dvo.com and request a link and instructions to re-install on a MAC. This problem has been fixed in the newest version. Just click Help->Check for Updates to update your software. When finished, click Help->About to see what version you have. If it is higher than 10.0.12, you should not have this problem anymore. Cook'n 10 for Mac keeps telling me there is an update, but when I click "yes," it never updates. If you receive a message that tells you to update your Cook'n program every time you start the app, you must re-download and re-install Cook'n for Mac Version 10. Click here for more information on the solution to the update looping problem. I get an error that says "Data import failed" when I try to import a new cookbook. If you are getting this error message, you must re-download and re-install Cook'n for Mac Version 10. Click here for more information on the solution to the cookbook import problem. I'm having trouble importing older recipe files into Cook'n for Mac. Cook'n for Mac will import Cook'n recipe files (.dvo) and restore Cook'n backup files (.ckn) in the Cook'n version 10 and 10 format. Files created with Cook'n version 8.2 and below will NOT import into Cook'n for Mac. For those who have files created with a version older than Cook'n 10, the easiest solution is to follow the step-by-step process below. Download and install Cook'n 10 trial onto your WINDOWS computer. Create a backup file by selecting file/backup or just select a cookbook and choose file/export/Cook'n Recipe File and move that newly created backup (.ckn) or (.dvo) file to your Mac computer. Open Cook'n for Mac and choose file/restore for a .ckn file. Choose file/import/Cook'n Recipe File for a .dvo file. Cook'n for Mac installs but will not run on my Mac. Please check your operating system number. Cook'n for Mac runs on 10.6+ but may not run on 10.5 depending on your computer. It will not install on systems with an OS below 10.5. To check the Operating System number simply click on the apple icon on the very top left of the screen and select from the dropdown menu "about this Mac". This will open a window that says Mac OS X version 10.6.7 or whatever number your system is. If you are experiencing trouble installing Cook'n for Mac and your OS is 10.5.8 then consider upgrading the OS to 10.6. You can buy it from Apple for only $29 here. Cook'n for Mac runs great on 10.6.